While some Caribbean islands still struggle with the aftermath of the hurricanes which tore through the region at the tail end of 2017, others have benefited from shifts in cruise traffic which have enabled them to showcase their attractions to a wider market. Dominica, St Martin, St Thomas, San Juan and Tortola received the full brunt of hurricanes Irma and Maria, and had to be dropped from some winter 2017/18 Caribbean itineraries while repair work was carried out. This brought an upturn in cruise visitors for islands – including Martinique, Tobago and St Vincent - which were unaffected by the hurricanes. On Tobago, Gregory Donatien of local ground handler Carvalhos Agencies said the island’s key port, Scarborough had received new calls from the Marella Discovery, several MSC ships and P&O Cruises’ Britannia, while Tobago’s other cruise port, Charlotteville, had welcomed passengers from the Seabourn Odyssey. “We are definitely seeing cruise tourism growing, and we have been developing land products to court our extra visitors,” he said, adding that new jeep-based explorations of the island’s interior have been good sellers, as have beach trips. On St Vincent, Tourist Office representative Marlon Joseph said the island expected to welcome more than 300,000 cruise visitors during the 2017/18 cruise season, which has seen additional calls from MSC Fantasia and Tui’s Mein Schiff, as well as the Crystal Serenity, Celebrity Summit and the Norwegian Dawn. Like Tobago, St Vincent has been developing new shore excursion products to appeal to a wider range of visitors, particularly from Germany. “German visitors are very keen on nature, and snap up tours to the Soufriere volcano and our spectacular waterfalls,” Joseph said. This upturn in cruise traffic might be relatively short-lived, as cruise lines remain loyal to the storm-damaged destinations and are restoring them to schedules as soon as possible. P&O Cruises, for example, is reverting to Dominica and Tortola on schedules for winter 2018/19. But it has given some of the Caribbean’s less-visited islands a chance to put themselves on the radar by demonstrating how well they are able to handle big-ship operations, and P&O has said it will consider some of this season’s `replacement’ islands for inclusion on future programmes. It will have been a relief for P&O that Barbados and St Lucia were unaffected by the hurricanes as, while most cruise lines operate Caribbean cruises out of Florida, the UK market leader bases its vessels Britannia and Azura in the heart of the Caribbean, running charter flights into both islands. This enables P&O to make a seamless plane-to-ship transition a key selling point for Caribbean cruises aboard Britannia and Azura, as special arrangements at these two turnaround ports mean luggage can be taken under bond from its charter aircraft straight to the ships - so passengers go straight from plane to coach to ship, avoiding the stress of baggage collection and immigration queues. Despite the powerful impact of the two hurricanes, most parts of the Caribbean – around 70% of the islands - were also unaffected, and most of those that were hit are now making progress in repairing the damage and reopening for cruise calls and other tourism. By the end of February, the Caribbean Hotel and Tourism Association (CHTA) was reporting that nearly half its member hotels on the worst-hit islands (Anguilla, Barbuda, Dominica, Puerto Rico, St. Barts, St Martin, St Thomas and Tortola) had reopened for business. On Anguilla, these included the Quintessence Hotel and the Zemi Beach House. Air links to Anguilla from San Juan, and ferry links from St Martin (accessible on flights from the US) had also been restored, and a new ferry terminal is under construction. Meanwhile, more than 70 restaurants and food outlets had reopened, as had a number of tourist attractions, including Anguilla’s Tennis Academy and Aqua Park. Electricity had also been restored, though wifi access remained problematic. Barbuda – so devastated by Hurricane Irma that residents had to be evacuated to Antigua – is recovering more slowly. At the end of February there was still widespread loss of electricity; flights and ferry services were sporadic due to fuel shortages, and key tourist properties – including Coco Point Lodge and the Barbuda Bell Beach Hotel – are likely to be closed all summer, at least. But there are hopes of better times for the island ahead, with longer-term plans to build a US$250m eco-friendly resort, which could open in 2020. In the Virgin Islands, by end of February Tortola’s airport was open to flights from San Juan and other islands, and intra-BVI ferries were back in action, though there were still problems with water and electricity supplies to parts of the island. That said, tourist areas were reopening apace, with some 400 guest beds available. Dominica had also restored air and ferry services by late February, and had 40% of its tourist beds and 19 of its 23 main tourist attractions back in action, though electricity supply remained sporadic outside the capital, Roseau, and other key areas. In late January, TUI Cruises' Mein Schiff 3 was the first to call at the island after the storms, and the island is back on 2018 and 2019 schedules for a significant number of cruise lines, including P&O, MSC, Windstar, Carnival and Costa. 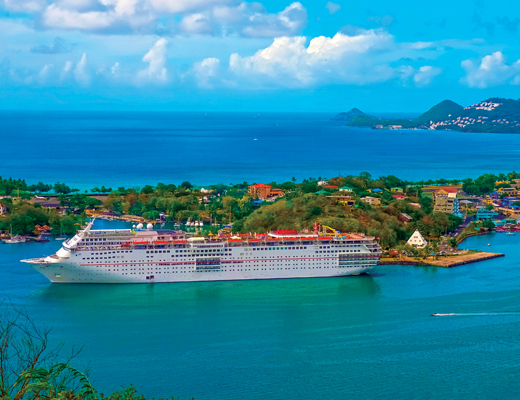 Puerto Rico also had its cruise port open in time for spring, with more than 100 shore excursions available. It expects to have welcomed 58 ships in March, and has largely restored its tourism infrastructure; by early March, more than 95% of its water supply was restored, as was more than 80% of electricity and nearly 100% of telecommunications. Finally, St Thomas – one of the Caribbean’s most popular islands with cruisers – is also well on the way to recovery. Most shops and restaurants in Charlotte Amalie and Havensight have reopened; taxi and coach tours are back in operation, and local tourism industry sources say cruise calls at St Thomas in January 2018 were only 10% down on the previous January, before the hurricanes hit.